If anyone seriously thought that Donald Trump was running for President out of high mindedness, you can give it up now. He was running to elevate his brand and market the Presidency for personal gain. Well, he just spent months on the campaign trail wearing a red cap with his campaign slogan, “Make America Great Again” on it. It became part of his campaign swag. Every president in history, and any future president, would retire that cap and donate it to the Smithsonian Museum or feature it in their future presidential library. Not this guy. He fully intends to market the image and make a killing off of it. Expect to see some version of it for retail next Christmas while Donald Trump is sipping brandy in one of his Presidential palaces. Billionaires! 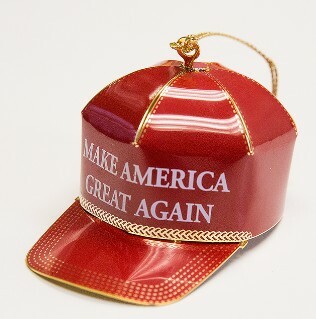 How much does this true-spirit-of-Christmas ornament go for this year? It’s yours for just $149 dollars and no sense! This is the sort of change I never expected, the selling of the Presidency by the President-elect himself. More than 45 million people, or 14.5% of all Americans, lived below the poverty line last year. I’m certain none of them can afford this overpriced campaign schlock. Perhaps the proceeds for this sale are going to fund food pantries or house the homeless over the holiday season? Well, there is nothing mentioned in the advertising to suggest that. 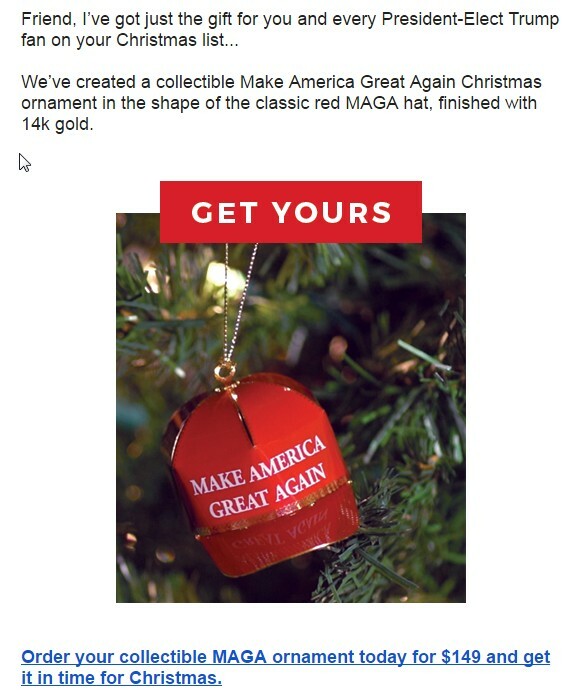 Maybe this isn’t really being marketed by President-elect Donald Trump. Maybe his business isn’t really financially benefiting. Could it be that some other enterprising fool is cleaning up on his political success? I thought of that, so I checked. 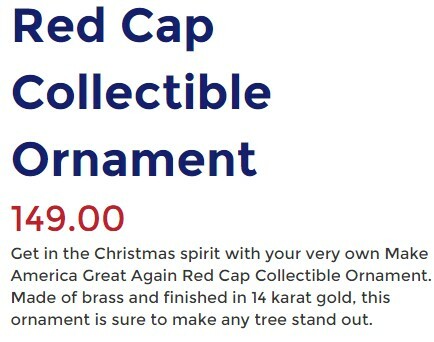 According to the internet advertisement, the link to buy the “classic red MAGA hat” is DonaldTrump.com. It’s his Trump store. 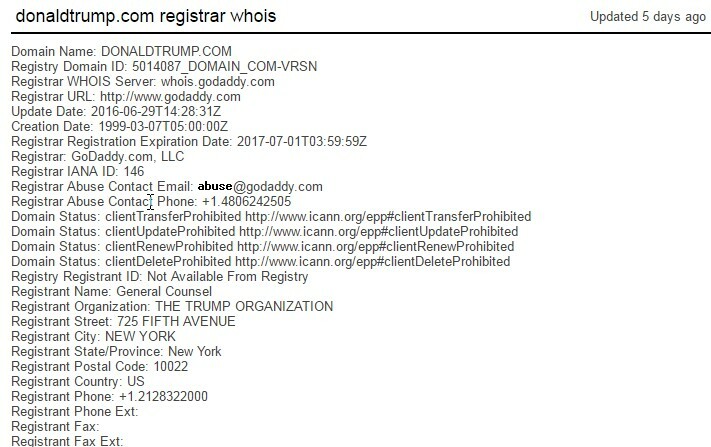 To be sure there wasn’t a mistake, I went to the Whois.com website and confirmed that the domain name is registered to THE TRUMP ORGANIZATION (see below). So there it is! Get yours America! (If you can afford it.) Is this supposed to be our new normal? Do we really have a President who is a businessman for himself first and President for the people last? This Christmas you should grab a bottle of Trump wine and drown your sorrows, because no one at the highest reaches of government will be marketing you cares away. Sen. Bernie Sanders (I-Vt.) would have beaten Donald Trump by a historic margin if he had been the Democratic nominee, according to a private pre-election pollprovided to The Huffington Post. The national survey of more than 1,600 registered voters, conducted by Gravis Marketing two days before the general election, found that Sanders would have received 56 percent of the vote while Trump would have won 44 percent. The poll was commissioned and financed by outgoing Florida Congressman Alan Grayson, a Democrat who endorsed Sanders in the presidential primary. The last election result that decisive was Ronald Reagan’s victory over Democrat Walter Mondale in 1984. Of the result validity of these poll results I have no doubt. Bernie Sanders was to the Democratic Party what Ronald Reagan once was to the Republicans, except the DNC didn’t allow a fair contest between him and their establishment pick. Instead the DNC made sure that the most establishment candidate the Democrats had would run against the most anti-establishment Republican candidate in history. The twin phenomena of Trump and Bernie movements screamed its warning about the mood of the people, but the DNC thought it knew better. And if you think Hillary lost because she wasn’t progressive enough, or effective enough, or because she was a woman, or because of the emails and FBI mess, then you still don’t get it. Her problem isn’t with her. It’s much bigger. Our government is far more broken than most of us are ready to admit. Many of the folks who voted for Trump know this in their heart. They feel it every day. They just don’t know why government is broken and they have been lied to about it for years. Their frustration and anger was exploited by this demagogue who goes around blaming the wrong causes for our brokenness in order to divide us and gain power for himself. We, the People, have long been disempowered. We have been rendered irrelevant by the wealthy elite and corporate power. This is the source of our broken government, and the road back to a healthy Republic just got a lot longer. I do not disparage Hillary supporters at all. I love them for their ideals and courage. While I have differences of opinion with her, I respect Hillary Clinton as a person and a candidate. I agree she was the most qualified candidate on paper. Most of the terrible things people have said about her are nasty lies. I’ve been saying that for years now. That said, she was still the wrong candidate to face Donald Trump this year. The difference between her and Bernie Sanders is not just by degrees of progressive policies. The real difference between them is a whole paradigm shift in governance. It is a paradigm that empowers citizens over businesses, power and wealth. This is what the pundits missed. This is what many Hillary supporters couldn’t see. (New paradigms are difficult to imagine when our thinking is rooted in the context of an older paradigm). One more point, if I may. A lot of Democrats defend the early actions of the DNC’s loyalty to Hillary Clinton. They say she came so close the first time and deserved a second shot. But four years is a long time, and things change. It’s like when military generals base their planning on the last war. More importantly, loyalty is the opposite of democracy. Party loyalty to a “chosen” candidate is critical for a successful a presidential campaign, but democracy is still essential in choosing the right party candidate. That’s why it is critical that the DNC always remain neutral and equitably support all candidates. Their role in the primary phase is to conduct a fair and free primary campaign, to let the people speak. The DNC failed our party and we lost, not just the Presidency but many down ticket races. In fact, Democrats have been losing election cycle after cycle at every level because the DNC has been interfering in party democracy to effect a result that fits their ideology and keeps like-minded Democrats in power. In short, the Republicans allowed a democratic process and nominated the democratically elected candidate, for which they have been rewarded. The Democratic Party interfered with democracy within the party and have been punished. The DNC’s loyalty to Hillary Clinton was grossly premature. If you superimposed the Democratic v. Republican Party Map over the US Population Density Map you clearly see that the more urban, the more Democratic and the more rural, the more Republican. This strengthens a case that has been made that our political tensions also line-up between city vs. county lines. Cities are the seats of power. They are the drivers of culture and the economy. People living in vast stretches or rural America are mostly marginalized and largely ignored, even by the establishment wing of their own party. All political promises have been empty for decades. No one is helping them understand what’s really happening to them as their jobs disappear, their wages shrink, their homes are foreclosed and their family life is disrupted. No one is lifting a finger to fix things for them. It was these areas where Trump’s messages resonated most. It was the folks in these areas that came out to vote for him in record numbers, against the backdrop of the lowest overall voter turnout in years. This year, the rural vote mattered. All establishment politics is urban centered, so the anti-establishment sentiment that swept Trump into power is a wake-up call from rural heartland of America. People living inside our urban bubbles take note: Political inclusion isn’t just something that needs to happen inside the urban bubble. Donald Trump won because the GOP allowed their party’s popular choice to be nominated even though he wasn’t the establishments choice. Democrats lost because of the anti-insurgency bias against a popular anti-establishment candidate, a bias baked into the Democratic primary process. I blame the DNC for its epic failure to read the mood of the country, for thwarting Bernie Sanders at every turn and for fielding an historically unfavorable establishment candidate. It is clear that the DNC completely underestimated how much Hillary Clinton is disliked, or how well Trump resonated with so many citizens. The electorate clearly wanted to send a message to the establishment. Thanks to the DNC that message has been delivered in it’s most virulent form possible. You can say she lost because she is a woman, and you are be partly right. You can say she lost because President Obama is black, and you are be partly right. But mostly she lost because no establishment candidate could have won. She and the Democratic Party failed to see or understand the lives of so many struggling, marginalized and forgotten families living below the radar, especially in rural America. She lost because she represents the very establishment that let so many American’s before, during and since the Great Recession. I have more to say, but not now. It’s all still too damn depressing.